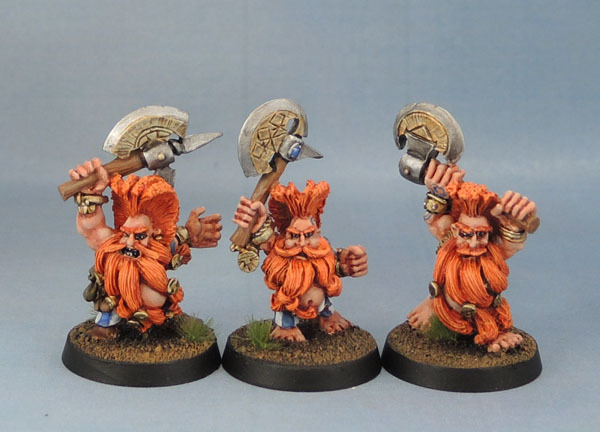 Another Trio of Citadel WHFB Dwarven Giant Slayers (1993-4) | Azazel's Bitz Box. Another trio of early-90’s Slayers today. Not a lot to write about these guys as we’ve seen others of their ilk before quite a few times by now. These three have been painted with paler, more faded – slightly pastel even rather than “natural” – hair. A couple of different tones of blue for the stripey trousers, but both wearing the traditional style. Once again, I think the tattoos turned out well. 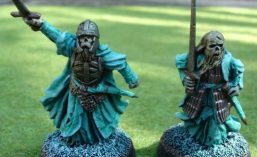 This entry was posted in Age of Sigmar, Dwarven Grudgebearer Army, Kings of War, Warhammer Fantasy - 9th Age and tagged Classic Citadel Miniatures, dispossessed, Duardian, Dwarven Slayer, Giant Slayer, Oldhammer, Warhammer, WHFB. Bookmark the permalink. Well done. That should be close to an impressive horde of dwarven slayers! Is that bloke on the right actually wearing any pants – blue striped or otherwise? Makes me wonder if anyone else ever got chance to buy any Slayers in Aus – Looks like you bought them ALL! Great work, particularly love the striped pants and tattoos on these. You’re on “fyre” lately man. Nice work on these. Brilliant models and I love you have painted the stripy trousers, well done! So cool – and wow, with all of the other guys, that’s a whole boatload of slaying! Once again excellent stuff. 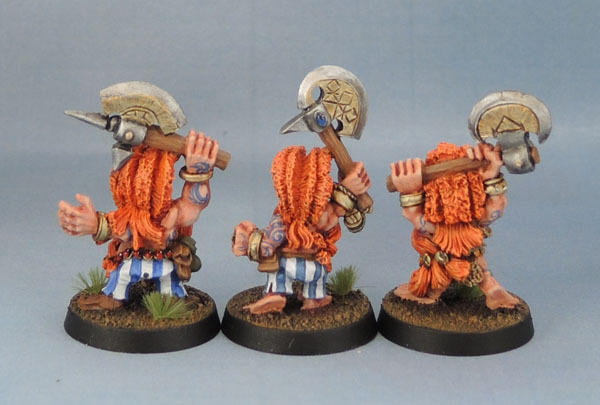 The Obelix pants look excellent and overall their slayerness convinces! Thanks, I plan to get back to the Slayering again at some stage in the medium-term. Excellent, Goblins and Orks beware. I’m really loving these orange beards. I’m going to have to try to do something similar sometime with one of my guys. Great miniatures.